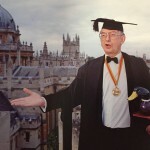 The unexpected death (at the age of 77) on 13 July 2015 of Martin West, the greatest classicist of his generation, has left a hole in the world of scholarship and philology. It also leaves me with a sense of profound personal loss. He was a presence in my life and thinking since I first encountered him 37 years ago. In the past 15 years, we interacted regularly regarding matters that were central to both our interests, not least ancient Greek music. I append here a few mainly personal reminiscences, so that they may not fade from memory as time passes. When I first met MLW in 1978 I was studying music in London and had just spent much of the summer working slowly through his magnificent, recently-published, commentary on Hesiod’s Works and Days. My prospective Oxford tutor, Nicholas Richardson, had invited me to a Classics event in London, and in the break he introduced me to his former doctoral supervisor: ‘This is Martin West’. I gawped at the sprightly figure, who looked nothing like the grey-haired sage that I assumed had written the magisterial commentary. ‘You’re not the Martin West?’ I said. A worried look crossed his face: ‘That depends on who the Martin West is’, he said. ‘The one who wrote Early Greek Philosophy and the Orient and commentaries on Hesiod,’ I said. His face brightened up: ‘Yes, that’s me.’ ‘But you look so young!’ I exclaimed. ‘Well, I am quite young,’ he retorted cheerfully. ‘How old should I look?’ I turned red with embarrassment, but he had a twinkle in his eye. Many years later I recounted to him the tale of that first meeting. He had no memory of it, and chuckled with relish. But I seldom spoke to him without saying something that made me feel as gauche as I did on that occasion. I was far from the only person who felt like that; his shy reserve, and habit of waiting and thinking before responding to any question, even trivial ones, has been well documented. It was said that he was a man of few words in seven languages, and his reticence was bound to cause anxiety to many of his interlocutors. But on quite a few occasions, including a dinner in Jesus in to which I invited him in 2006, and one at All Souls at which I was his guest, I found him forthcoming and humorous about matters great and small. I was surprised to find, however, that he was not as accurately informed in all matters as he was in the Classics; for some reason he was convinced that I had been educated, as he had been, at St Paul’s School, and clearly found it hard to assimilate the fact that this was not the case! It was not an important error, but it made me wonder what the source of his misapprehension was. A few years earlier I had sent him my article on the Greek alphabet, and he had written me a note of thanks (in his rather childlike hand) with the words: ‘I am impressed that you have managed to extract so much out of such slight evidence’. I was uncertain about the connotations of ‘impressed’ in this case. At dinner, however, when he asked me what I was working on, I said I’d just written a piece about ancient music, but had held off from sending it to him. ‘I’m worried you might find it too fanciful’ I said — ‘fanciful’ was one of his characteristic words of criticism. ‘But you’re one of the classicists whose work I’ve always thought worth reading’, he said straightforwardly. It was a heart-warming endorsement from such a great scholar. I knew that he could be kind to his students and to those of whose scholarship he approved, but he could also appear sharp and unforgiving in writing about others’ work. This was mainly because of his desire for unvarnished accuracy. I discovered this when, having returned to academia to do my PhD at UCL in 1994, I submitted my first article to Classical Quarterly in 1996. The article presented an original solution to a long-standing problem in Greek musical history, one of the subjects in which West had become an acknowledged world expert following the publication of his book Ancient Greek Music in 1992. I had given reasons to dispute and augment some of his statements in my article. When the anonymous referee’s report came back to me, my heart fell because it appeared to be a page of blunt dismissals of some of my less well-supported points. My supervisor Richard Janko immediately recognised the style of MLW; and I initially assumed that the catalogue of my apparent howlers would disqualify my piece from publication. However, the page was headed by the brief sentence ‘This is an important and original article and should be published in some form’. When I spoke to the journal’s editor Stephen Heyworth he assured me that from the hand of this referee that was a strong recommendation, and in the event I was immensely grateful that I could take advantage of West’s unparalleled knowledge of the subject in revising the piece. Before my article was published, I was invited to present it as a talk at an Oxford Seminar series in Corpus. Around 15 scholars including Ewen Bowie, Robin Osborne, and Martin West were present as I set out the reasoning that had led me to my conclusions. At the end of my 55-minute presentation, the audience were invited to ask questions. There was a long silence; it felt as if all present were waiting for MLW to cast the first stone. He was scrutinising my handout, but eventually looked up and announced to all and sundry ‘This is absolutely right’. There was an audible reaction — intakes of breath and murmurs of assent or surprise — to this pronouncement. Afterwards Ewen Bowie said he had never heard MLW be so complimentary at a seminar; I must have slipped something into his drink! But I have heard West being even more complimentary. At a seminar I organised on ancient music in 2013, the astoundingly clever Stefan Hagel gave a paper applying statistical methods to the singing of Pindar, at the end of which MLW simply observed ‘Well of course, this is brilliant’ — to a similar audible reaction. Strangely, after my seminar presentation I chatted to West and said I gathered that he had already refereed the article on which my presentation was based. To my astonishment he denied it. I was relieved when the following day I received a note from him saying that on checking his papers he had discovered that he had indeed written the report; his recent work having turned his attention away from music, he had not remembered having done so. West’s reputation as a stern critic was reinforced by the stringent tone of some of his reviews. He dismissed three poststructuralist scholars in print with the searing (but brilliantly funny) characterisation of them as ‘a curious tricolour…the Raw, the Cooked, and the Half-baked’; and he once expressed exasperation at an eminent Professor’s failure to distinguish ‘oral’ from ‘orally composed’ poetry in a review which ended with the extraordinarily patronising comment (unacceptable from the pen of any other reviewer) that the latter ‘really must try to get his capacious head round the difference’. MLW was uninhibited about writing things the way he saw them, no doubt because of a particular condition of mind that accompanied his own brilliance. I was bound to feel the edge of his sharp pen from time to time. I felt personally chastised when, in a review for the Journal of Hellenic Studies, he dismissed (I think unfairly) another scholar’s book that I had recommended for publication, ending the review with the words ‘OUP were badly advised in this case’. When I spoke at a conference on Greek music in 2014 I commented that a number of features of the Seikilos inscription had made me wonder fleetingly if it was an accomplished forgery; I received a sharply reproving email from MLW (‘out of the question’), ending with the words ‘you should rather question your own presuppositions about Greek music’. Of course I felt he had his blind spots about music, which he approached as a philologist rather than as a musician: thus I was never able to persuade him that while Greek strophic music might show precise metrical correspondence, this did not require that the melody was repeated note-for-note (as in a Church hymn) from stanza to stanza. I greatly regret that I did not have the chance to draw his attention to the practical demonstration of my ethnomusicologically supported view, in a BBC 4 programme which came out 2 months before he died, where two stanzas of Sappho’s Brothers poem are sung in Mixolydian mode but with different melodic contours based on word-pitch. I once posted Martin an offprint from my home in London, and received a note of thanks in which he wrote, à propos of nothing much, ‘I was curious to see your home address; a former girlfriend of mine lived on the same street’. (I knew he had once lived in NW3, in the same house as the Roman historian John North, because Alan Griffiths told me he’d once posted a letter to the latter in NW3 wittily addressed, in homage to Hitchcock, ‘North bei North-West’). In Ancient Greek Music, MLW muses about the difficulty of translating ‘auletris’, the term used for a female player of the aulos and standardly translated ‘flute-girl’. The traditional translation ‘flute’ is misleading — auloi were pipes with double reeds; while the performers were more often experienced entertainers than youngsters. He reluctantly offers ‘pipe’ and ‘shawn’ for the instrument, and adds ‘I have found no very satisfactory solution to the girl problem.’ Whatever the point of this humorous double entendre, I more than once witnessed his ability to charm young women, as he surely did in the case of his delightful and clever wife Stephanie (the tale of whose first visit to Delphi with him he briefly and amusingly tells in that book). Once at coffee during a conference at Oxford I introduced him to an attractive young colleague from another place. ‘You look like the kind of person who would enjoy studying X’, he said to her, naming an obscure ancient poet. She gasped with astonishment — ‘X is the very poet I’m studying at the moment!’ He kept up the appearance of sage clairvoyance for a minute or two before admitting that he had seen her name on the list of delegates and noted that she had said she was studying the works of X. But by his humorous subterfuge he had broken the ice immediately, and the conversation flowed. ἤγαγεν, ἐμνήσθην δ´ὡς ἅρ᾽ ἔγραψας ἅλις. I thought of all you’d written, and I cried.